A group at work started some sessions to establish our vision for the function we perform. The individuals in the group range from quiet to expressive. They all have skills with some specialization learned over years. A few things struck a chord that resonated with me and the topic of this blog, Managing the Business of You. First, it is important to have a personal vision for own’s own business (i.e. life). When we have an idea of what and where we are now in comparison to who we want to be, we readily integrate into a group’s vision for the future. The thing is, it’s easy to get caught up in the throes of daily living, problems and strife and forget what we truly want. Second, the current approach to management in many companies is dictatorial and centralized. This has the potential to undermine an individual’s creative energies. When told what to do, we enter into a compliance mode instead of a shared vision that fosters creative tension to bring about what we truly want in our life and job. When asked to share one’s vision and integrate within a group, it can elicit thoughts of war against the industrial machine. It can be a philosophical mutiny of sorts. The paradigm of the business world is fundamentally changing. If we continue on our current path of over consumption and seeking only profit, we will create insurmountable problems for ourselves and environment. As Peter Senge points out in a Necessary Revolution, we have the opportunity to change our course and steward resources in support of our future. To do so, we need a change in thinking. This change needed is to see the system we are, the business of you, and how it is interdependent with the business of others, organizations and our environment. When we manage our personal business, we create opportunity to integrate with others in ways unimaginable when we are focused on gain only. 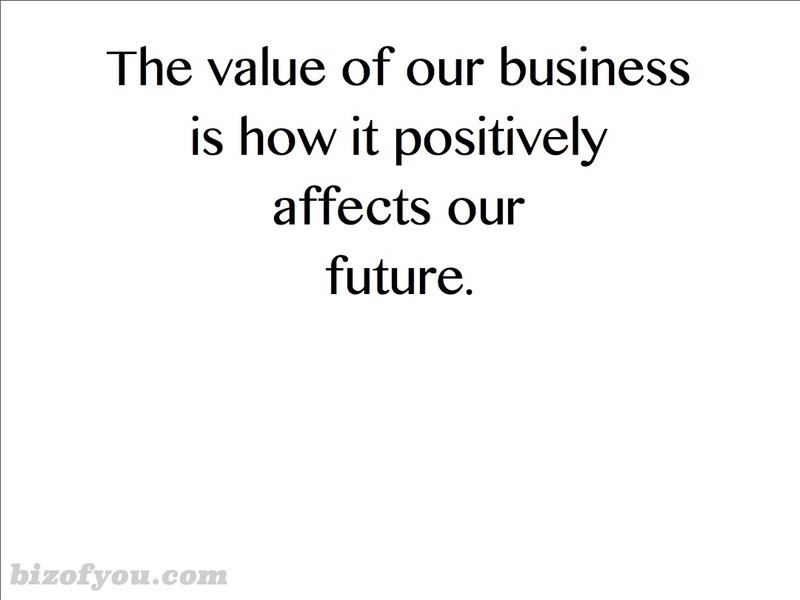 The value of our business is how it positively affects our future. our opportunity to affect our future is now.